My new life began today, at the age of 58. In fact, I’d say that this is easily one of the happiest days of my life. Given the events of the last 18 months, that’s saying a lot. Last Saturday, I toured a house for sale in Suffolk, Virginia. Today, 10 days later, we closed. This house is beyond anything I could have hoped for and dreamt of, and it is the house that I have waited for my entire life. 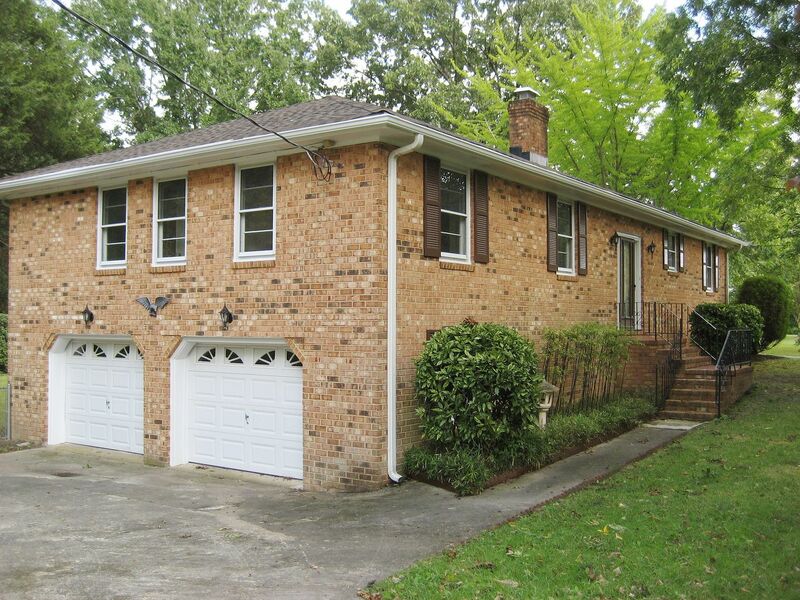 It’s in perfect condition and has a new roof, new carpet, new paint and a tiny kitchen. If I were to sit down and design a house today, it’d probably look much like this house. It’s perfect for me and my new life. It’s small enough to be manageable and large enough for my furniture. It’s extremely well-built, and I’m told that the home’s first (and only ) owner was a military man who kept everything in perfect order. And it shows. In every way - it shows. This house is a peach. It was built by a Vietnam-war veteran in 1976, and designed by his bride, a native of Japan. The 1/2-acre lot is filled with exotic and extraordinary plantings. And it’s surrounded with a chain-link fence, perfect for Teddy the Dog. 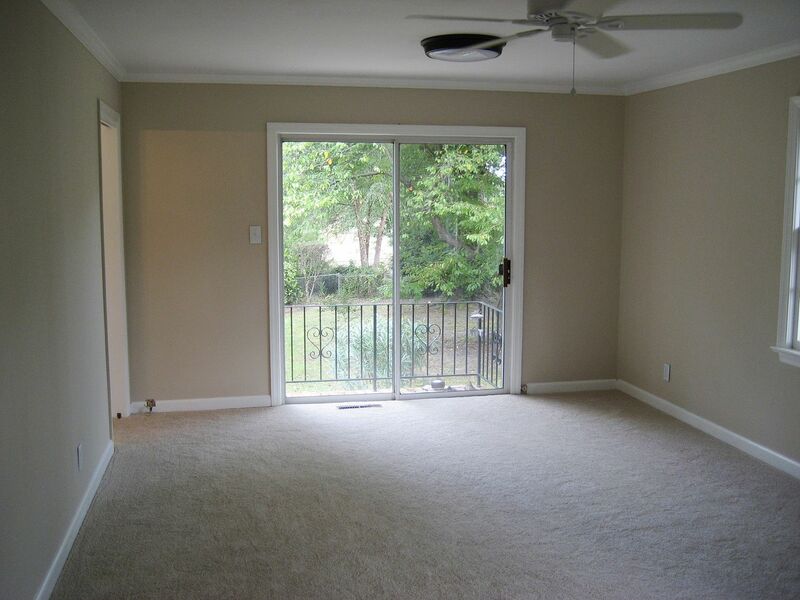 After closing, after I entered my new home for the first time, I stood in the living room and wept. They were tears of joy. Today, I can answer that question: Yes. I now remember how it feels to experience happiness. Took me 18 months to get here, but I feel those glimmers of joy stirring in my soul. I’ll never be the same person. My life was forever changed by Wayne’s very poor choices. But today, I am happy, and it feels so good. Thanks for your prayers. Thanks for staying with me. And thanks for helping me remember that I am someone other than the widow of a man who ended his life. 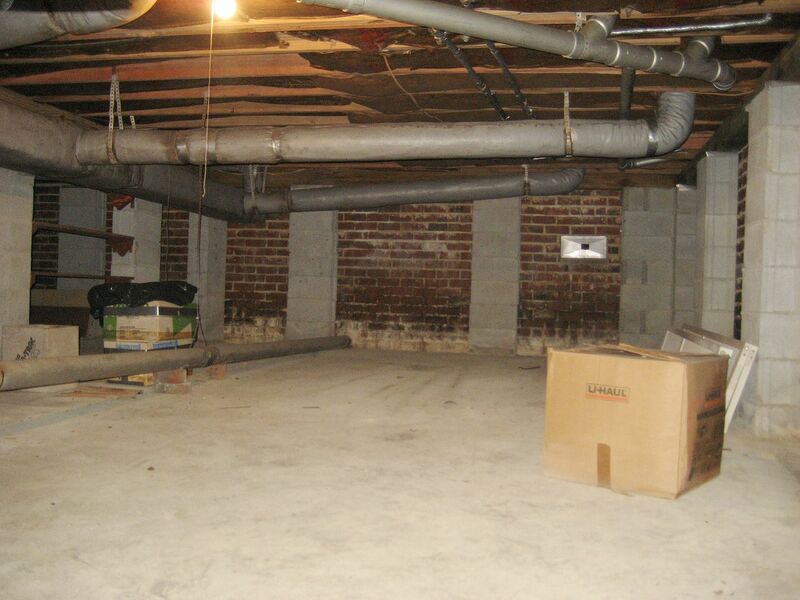 Here in Hampton Roads, it's almost impossible to find a house with a basement/garage and yet it's a feature that I love. The garage is more than 600 square feet. The house is near an estuary of the Elizabeth River, and yet it sits high on the lot. 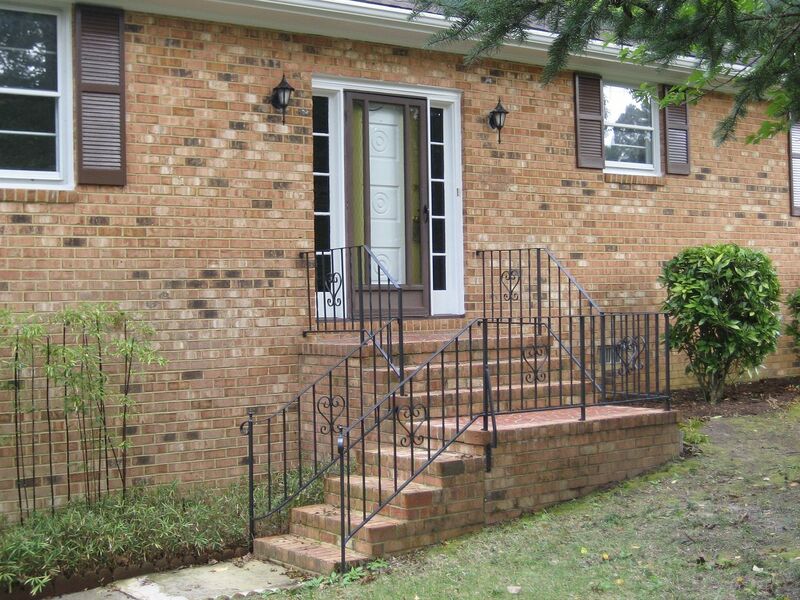 One of my frequent complaints about brick ranches is that they sit so low to the ground. This feels like a treehouse! 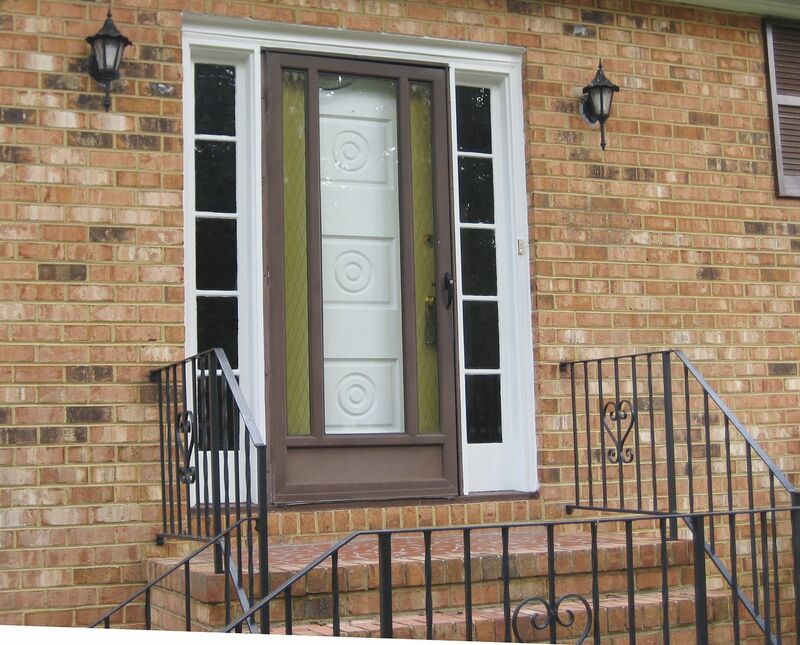 The front door is reflective of a Mid-Century house, and yet this house was built in 1976. Everything about this house is in perfect order. Inside, there's a small foyer and access to the basement/garage and also living area. It's a design that I've never seen before, and yet it's delightful and compelling. Simplistic, but elegant! 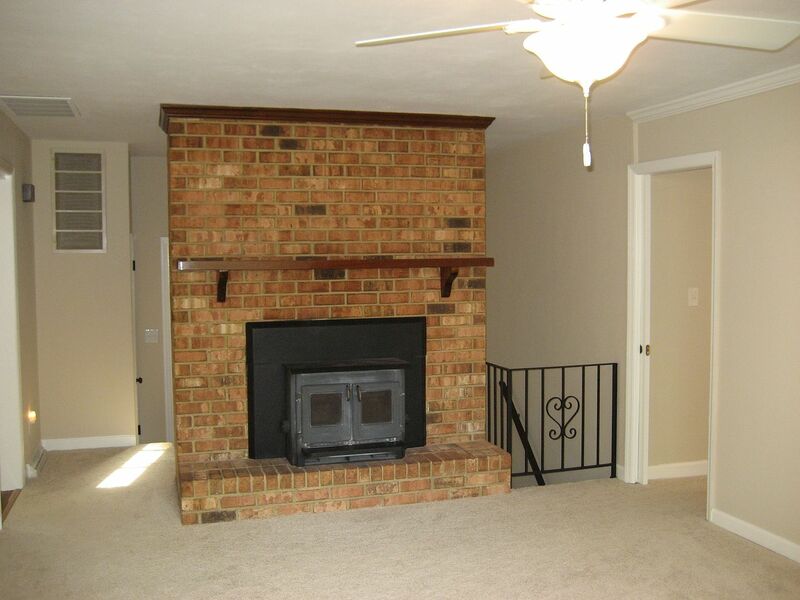 Inside, the massive fireplace dominates the living room, which is one of my favorite features. To the right are the three (small) bedrooms, separated with a sliding door. Ideal for someone who craves quiet! A large den at the far right of the house is filled with large windows, which is another delightful feature. 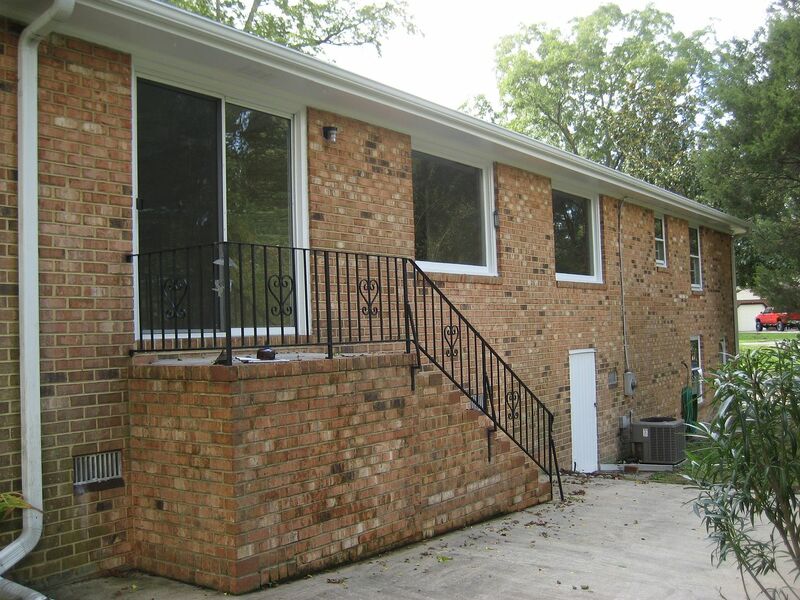 Because there's no attached garage, the house has no blank (windowless) exterior walls. 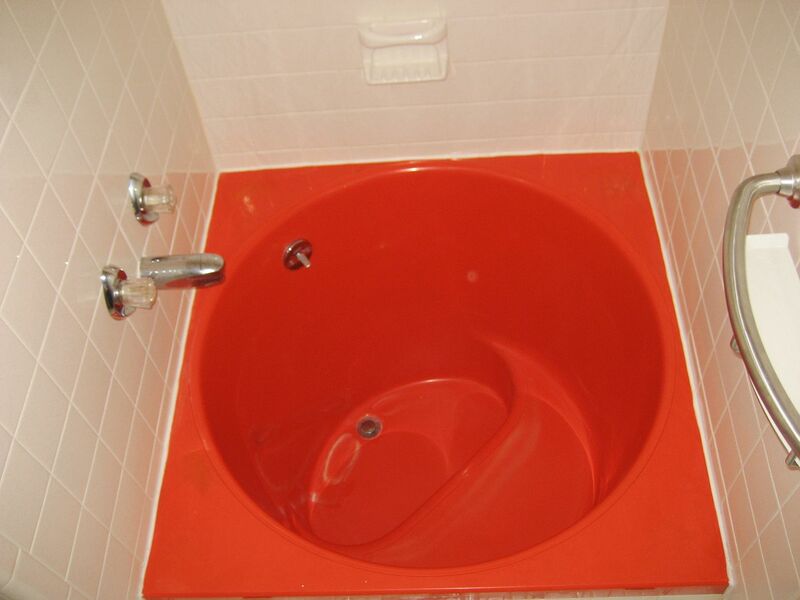 Another delightful feature: A Japanese tub in the master bathroom. I've owned this house for four hours (as of October 10th) and I can hardly wait to give this massive tub a test drive. It looks purely delightful. 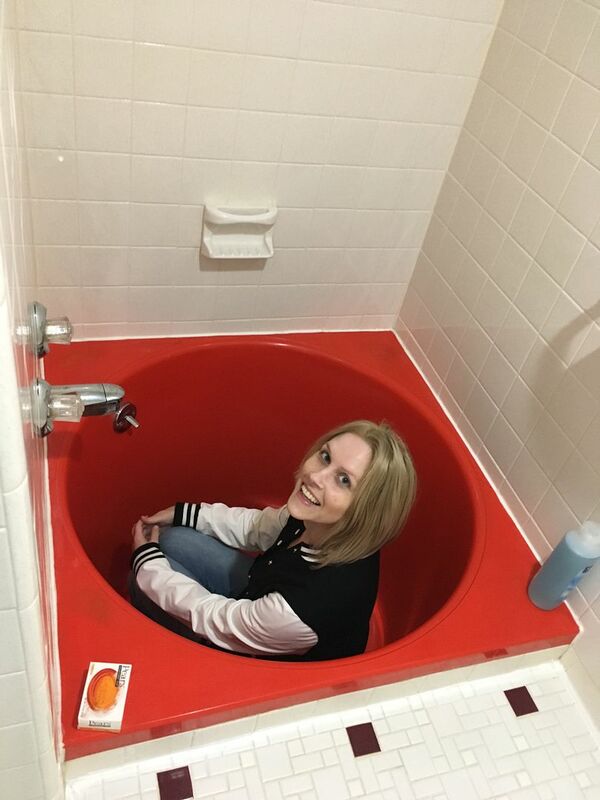 Update: My daughter came for a visit today (October 15, 2017) and sat right down in the tub, to give a sense of proportion and scale. 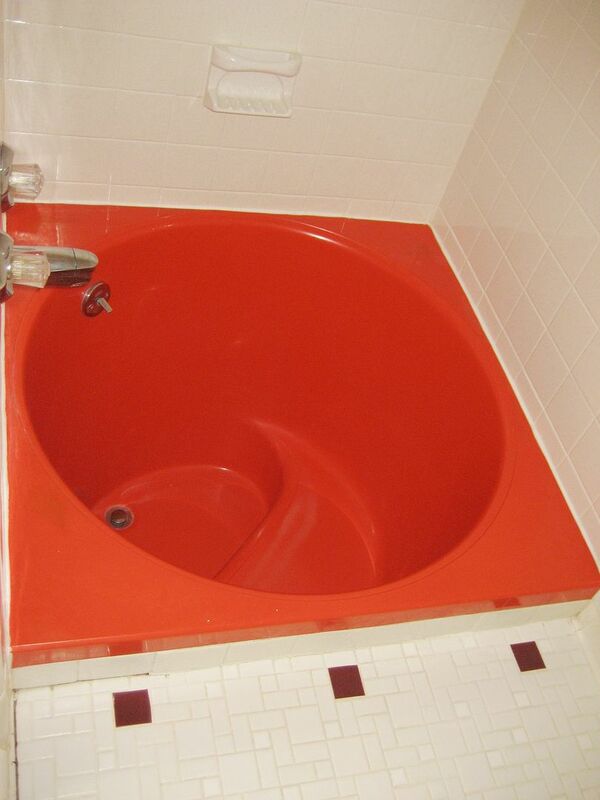 Made by Kohler, this tub is original to the house. The kitchen is small, which is just right for my needs. The house is old enough to be sturdy and well-built, and yet is filled with modern conveniences and clean shiny surfaces. Another fine feature: The basement. As someone who loves old houses, it's very important to me that I have access to the mechanical systems. Here in Southeastern Virginia, so many houses are built on miserable crawlspaces and are barely navigable. This house is built up high enough that you walk under the house - from front to back. From front to back, the house is perfect in every way. Thanks to Kathy Worthen for making this happen. Yesterday, suddenly, Teddy the Dog became ill. We dashed off the the vet, and while we waited to get “worked in,” I started getting “worked up.” Sitting beside the stainless steel table in the exam room, looking at my old dog, I started to cry. In my troubled mind, I knew this was the end for my little Sheltie. I cried a few more tears and then sobered up. When the doctor appeared, he asked what was going on, and I explained that she’d had diarrhea and now the soft skin on her pink tummy was sloughing off. And then I stifled another crying jag. I don’t remember the doctor’s name, but he was a patient soul. When he said she was going to be fine, I started to cry again. Teddy was there when Wayne ended his life. She heard it, saw it, and apparently tried to “wake him up” by licking him and circling the chair repeatedly. Teddy lost both of her “people” that day. Wayne died. I lost my mind. For a time. Both Teddy and Mother are doing better these days, but we still are struggling. We’re in rental housing and that’s not ideal, but it was the best we could do with the mess that we were left. In the first four months, Teddy had two surgeries, both of which involved life-threatening emergencies. In that same time, I had a minor outpatient surgery - the first in my life. Before The Bad Thing™, Teddy was the most laid-back dog you’d ever meet. Thunder storms, loud noises, fireworks did not faze her one bit. Now, she’s a different dog. Loud noises cause her much anxiety. Both Teddy and I put some effort into avoiding loud noises. And when she’s on leash, she’s showing some aggression to other dogs, big or small. Because of this, I try to keep a tight handle on her around other dogs, but yesterday in the vet’s office, some woman with her little Yorkie thought it’d be cute to let her dog sniff my dog. I was at the counter paying the bill and didn’t see her approach. Teddy snarled and her hackles went up and she bared her teeth. She was poised and ready to strike. As I reined in Teddy, I saw the look of disgust on the woman’s face and saw her whisper something to her husband as she walked away. I’ve seen this same face when Teddy and I are out for our evening constitutionals. One of my “dog people” friends told me that in Teddy’s world - Teddy probably feels like she is protecting me. She’s fine at Doggy Day Care (which we visit a couple times a month), but the trouble starts when she’s on leash with me, out in the world. That comment helped a lot, and gave me much peace. Dear little Teddy sees me as someone that needs protecting. Endears her to me ever more, if that’s possible. That was not helpful. In fact, it hurt like hell. In the meantime, Teddy and I move through the days and we are both striving to stay healthy. And the good news is, 24 hours later, Teddy’s skin infection is already on the mend. To read more about Teddy, click here. To learn about the big fancy Sears House - the Magnolia - click here. 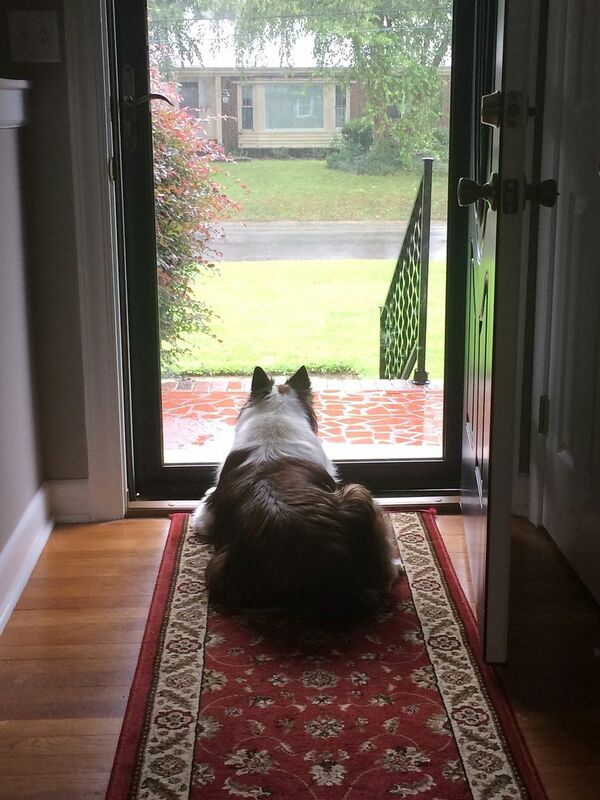 On a rainy Tuesday in Southeastern Virginia, Teddy watches the world go by. The tips of those precious little prick ears turned white in the days following Wayne's suicide. In about two weeks, the long-awaited book on Penniman will be arriving at my home. That’s the very good news. As dear friends and faithful readers know, there’s a lot more to this story. If you’re interested in reading the back story, continue on. 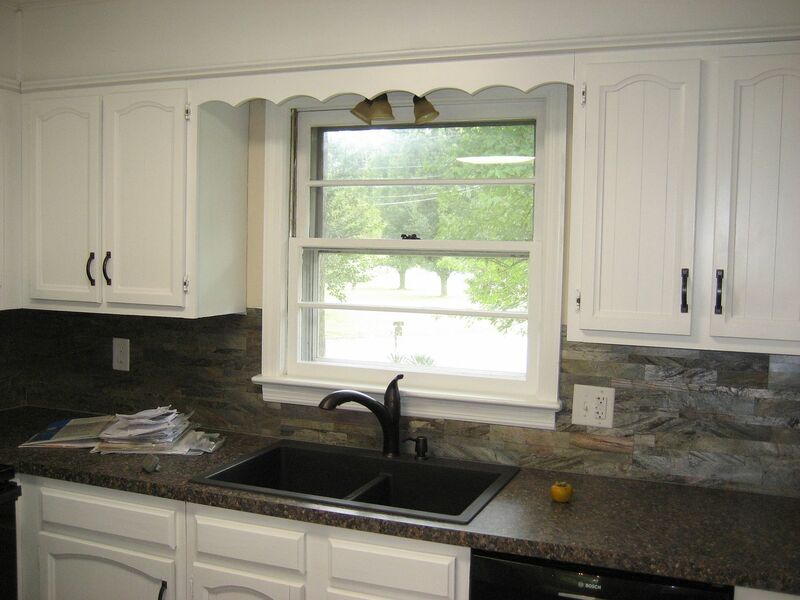 If you’re here to read about the Sears Homes, click here. Almost 14 months ago, on April 10, 2016, my husband and I met with the editor that I’d hired to do the final edit on my manuscript on Penniman. It was a Sunday afternoon. The editor was confident that the completed manuscript would be returned to me in about two weeks. After that, it wouldn’t take long to incorporate the changes and send the book off for printing. Five years of research and study and digging and effort was finally coming to a close. The book was finished. During those long days, when completing this comprehensive tome looked impossible, I’d close my eyes and imagine the finished product resting in my hands. In my vivid imagination, I’d caress its beautiful cover, pull it open to a center page and listen to the soft sibilant sound of the book’s spine being unfurled for the very first time. Next, I’d plunge my face into its bright-white pages and take in the aroma of that fresh-off-the-press smell. There were many times that I got so overwhelmed by the enormity of the research that I started to think that this was an impossible task. “You shouldn’t work so hard,” he said half-heartedly. At the time, I assumed the “half-hearted” part was due to his knowing that once I set my mind on something, it was done and done. 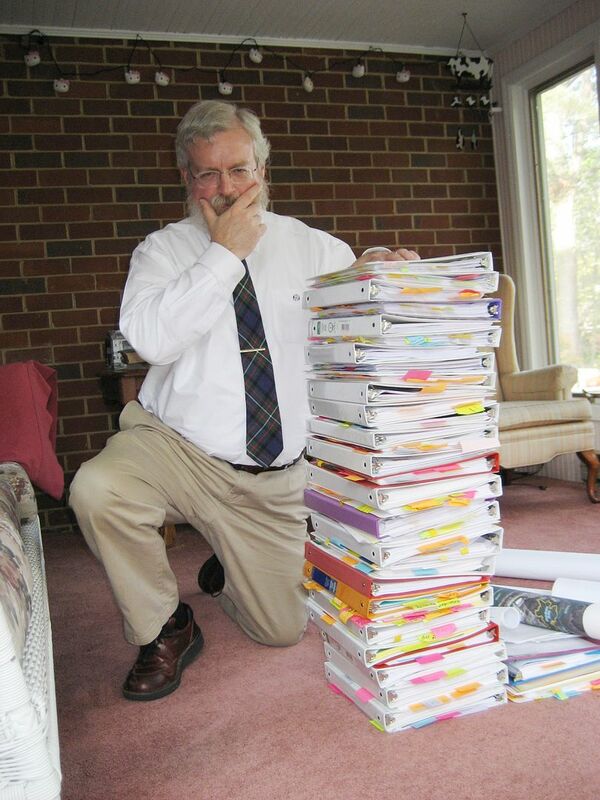 On April 11th, my husband came home from work and after I gave him a big hug, I posed him in front of all the research materials, filed, organized and boxed up, ready for storage. “Look erudite,” I told him with a big smile, as I stroked his silver hair and kissed his cheek. He struck a delightful pose and I took many pictures of my beloved, and posted the best one on Facebook. Looking “erudite” was no problem for him. He had an IQ well north of 160, and a flawless eidectic memory. I was in awe of his intellectual prowess. As a person with a natural love of learning, I thoroughly enjoyed just listening to him talk. Through the years, Wayne had been an integral part of the Penniman book. 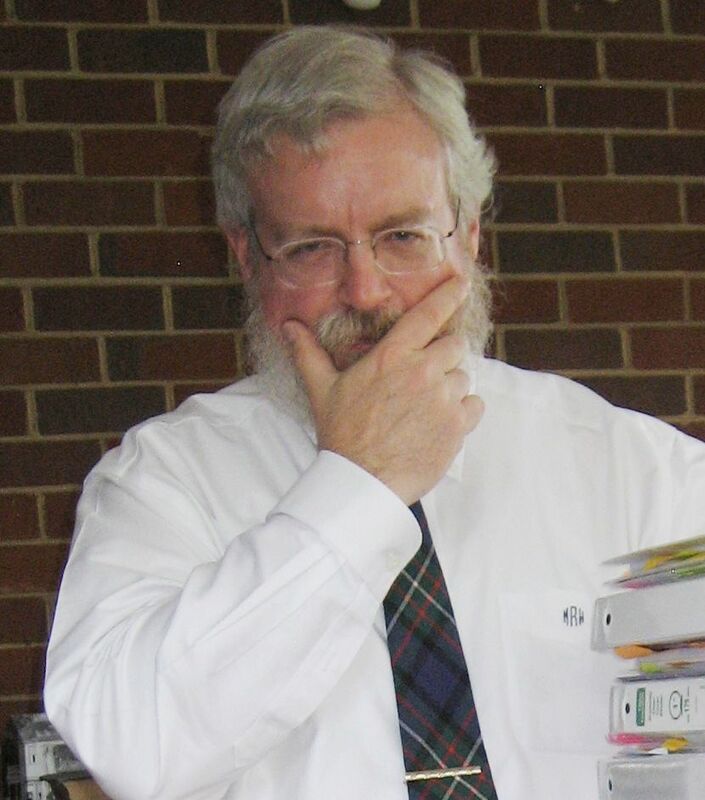 He’d been the preliminary editor on every bit of it, and many an evening we spent an hour or two reviewing a page or a chapter, discussing phrasing, word choices, and historical accuracy. He read every chapter and I was excited to read his edits and commentary. It was just one more place where his shockingly high IQ shined through. Wayne’s “fingerprints” were all over that book. And unfortunately, because of that, every paragraph, every sentence and every word within its pages would become a painful memory of my husband. My husband. The man with whom I intended to grow old. The man to whom I entrusted my extremely sensitive and delicate heart. 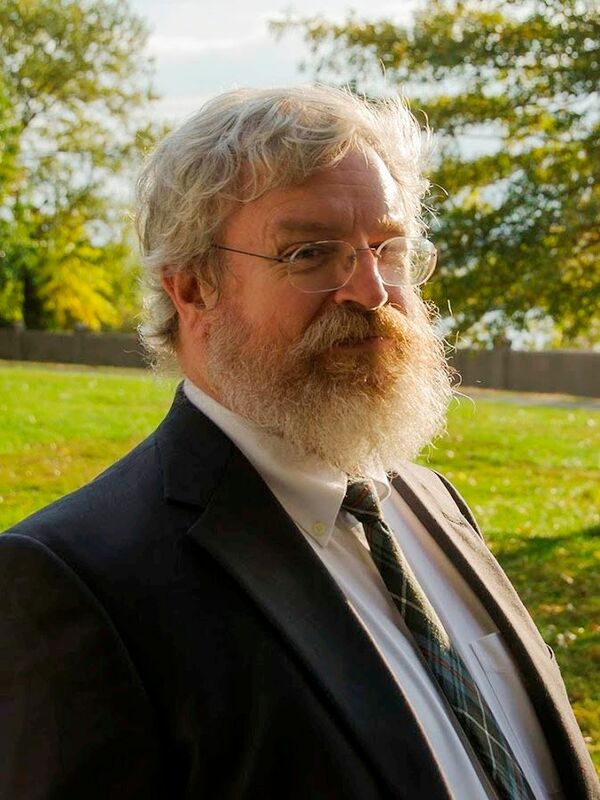 On April 18th, 2016, one week after he “looked erudite,” Chief Deputy City Attorney Wayne Ringer left City Hall and ended his life. If I live to be 112, my life will always be divided into two compartments: Before April 18th and After April 18th. The old Rosemary died that day, eviscerated by the holocaust of a spousal suicide. The new Rosemary is now, and will be for some time, a work in progress, but is still largely an emerging, amorphous form, and most notably, chronically dehydrated. I’ve yet to experience a single 24-hour period without soul-wracking crying jags. I don’t remember the date, but a few days after Wayne’s suicide, the editor contacted me to let me know that the manuscript was completed. In those early days, I was in deep shock. It was ugly and hellish. I don’t remember details, but I know that the blue notebook - which contained the editor’s marked-up copy - ended up in the trunk of my Camry and remained there for many months. For at least five months, I lived out of my car and spent the nights at a friend’s house about an hour from Norfolk. Each morning, I’d drive back to my home in Norfolk, pick up clean clothes, and then run around during the day, visiting doctors, lawyers, bankers, or friends, trying to sort out the surfeit of legal, financial, medical and mental problems that I now faced. I kept granola bars, Boost (liquid supplement), Funyuns and Gatorade in the trunk, along with a Bible, some inspirational books and spare clothes, together with a manila envelope which contained the important papers that I needed constantly. During this time, I was losing weight and suffered from fainting spells. If I stood up too fast, I’d sink right back down. When I would open that trunk, the very sight of the word Penniman made me nauseous. I kept hoping that repeated exposure would make it easier. It didn’t. In time, I covered the notebook with a beige towel and buried it in a box in the hinterlands of the trunk. Every few weeks, I’d carry the notebook into my friend’s house (in a canvas bag) and try to read through the edits. Still, I couldn’t do it. Back into the trunk went that tired blue notebook. In January 2017, a caring friend invited me to join him at dinner. He asked many questions about the book. By now, I had given up on the manuscript and decided it was a dead project. My mental health was more valuable than a book on regional history. As far as I was concerned, the manuscript died with Wayne. I just hadn’t buried it yet. I made a plan to donate all the research materials and the unfinished manuscript to a local library. That dinner with my friend was such a blessing. He showed me “no little kindness” and when I looked in his eyes, I saw love looking back at me. I was loved. Maybe I really was lovable. Maybe I was worthy of love. Maybe my husband’s last text - blaming me for his death - wasn’t a burden that I should carry for the rest of my life. Even the people at the periphery of my life were showering me with love. Today, the very memory of that love stirs my soul and lifts my spirits. I promised my little girl that I’d try. Opening the book, the dizziness and nausea returned. I paused, closed my eyes and said the simplest of prayers. I kept my eyes closed for a couple minutes. I decided that maybe one sentence would be plenty for the first day. And then I did that first sentence. And then another and another, and then one page was finished but then I hit a bad bump, and an intense memory of a discussion with Wayne washed over me and dragged me down under the waves. I slapped the book shut, closed out the computer screen and flopped on the nearby couch to commence the daily crying jag. And so it went, day after day. Getting through those pages was an act of divine grace and sheer willpower. In about three weeks, I had incorporated all of the editor’s corrections. After that, three friends gave of their time and brilliance to help me finish up all the “dog work” of incorporating photographs, creating captions, and putting it all together. Next, I had to read the manuscript from beginning to end. Again, many tears flowed. I was so weary. That was several weeks ago. Now, June 8, 2017, we’re drawing mighty close to the finish line. As of June 2nd, the Penniman manuscript is in production, 14 months later than expected. When I chastise myself for the delays, I remember, it’s a miracle of grace that this book will even see the light of day. It may not be exactly how I wanted it to be, but it is finished. In about 10 days, the “new baby” will be born. And as fast as freight can move those boxes, they’ll come to my home in Southeastern Virginia. At some point in the not-too-distant future, I’ll have the final product resting in my hands, where I’ll caress its beautiful cover, pull it open to a center page and listen to the soft sibilant sound of the book’s spine being unfurled for the very first time. Next, I’ll plunge my face into its bright-white pages and take in the aroma of that fresh-off-the-press smell. And then, I’ll put it back in the box, and turn the box label side to the wall, so I don’t have to see the word “Penniman,” and hope and pray that one day, the pain associated with that lovely name will ebb a bit, and that this unknown story will garner much interest, and will bring a blessing to every reader and to the community and to the country. In other words, sometimes the greatest blessings are lurking right behind the greatest sufferings. Every book comes at a cost to its author, but sometimes the cost far exceeds what the author was intending to pay. Less than nine months before his death, Wayne and I had picked out a “dream appliance” - a fancy side-by-side refrigerator with all manner of bells and whistles. It was a fine thing. We’d spent the prior three years planning this purchase. There was much discussion about options and colors and features and prices. And then one day, we went to Sears and made our selection. It was a happy day. It is a question that still plagues me, and yet it’s an intractable question. Like so many other aspects of this nightmare, the answer died with him. Several months before his death, the veneer of civility began to peel away from his persona (which is Latin for “mask”). While struggling to write a single paragraph explaining the composition of a WW1 155-mm artillery shell, I frequently turned to him for help. It’s hard to believe that any historian at any college or museum could possibly know more of early 20th century military history, munitions and armaments than he did. His eidectic memory and brilliance shown in this arena, too. With his eyes glancing down through his bifocals, he read the paper. He shook his head in disgust as he thrust the papers back at me. And with that, he stomped out of the room. More than a year before his death, we sat at breakfast and chattered away as we did every morning. He mentioned a female colleague, and went on and on about his great admiration for her intellect and mental acuity. It was a slice that cut me to the marrow. Throughout our marriage, he’d never been able to tell me that I was beautiful. And now he couldn’t even offer reassurances as to his pride in my intelligence. Eagerly, I sat down to read his writing. Below is a snippet. The conversation did not end well. I retreated to my room and wept. I loved him dearly, but I was beginning to wonder if he was preparing to leave me. Something was off, and at the time, I had no idea what was going on. “Promise me?” I’d say, still feeling very emotional. We had this conversation several times. The last time was less than a week before his death. For reasons that should be obvious, his suicide has been a very hard slap down of my once-strong faith. It’s hard to imagine that any 63-year-old man was the recipient of more prayers than Wayne, and yet, it ended so horribly. When I sequestered myself in August 2015 to finish the Penniman book, I had no idea that those were to be the last months of my husband’s life. “Come snuggle with me,” he’d often say as the sun set in the western sky, and most nights (thank God), I’d reply, “Okay, give me three minutes to finish up a paragraph,” and then I’d save my work, arise from the chair and spend time with him. Thank God for that. But now that’s another painful memory. The Penniman manuscript took up much space in my life and my mind and my heart. I convinced myself that telling the story of the “Canaries” at Penniman was God’s will for me, a utilization of my best talents, life experiences and passion for telling a story forgotten by the rest of the world. But was that correct? It doesn’t feel like it today. Perhaps in a few years or decades, the reception and success of this book will help me sort it out. I do know that - if I let it in - this devotion of my energies to a book in the last months of his life, could be another source of crushing guilt. Those were the last breakfasts, lunches and dinners I’d ever have with Wayne, and I spent many of them buried in a manuscript. “You need to turn off that computer and come pay attention to me,” he’d say frequently. Was that one of the clues that I missed? Looking back, how did I miss that? And more important, how do I forgive myself now? If I permitted it, the review and rehearsal of those excruciating conversations could lead me to insanity. I’m so very grateful that the Penniman book is done. If it had been left wholly to me, the unfinished manuscript would have been tossed into a bin and carted off to a local history room at the closest library. But thanks to so many dear friends, that did not happen. And today, I’m actually feeling a little joy and hope, looking forward to sharing the story of Penniman with the rest of the world. The book that cost me so much may well be one more thing that helps to lift me out of the mire. I find myself earnestly hoping that this book is well received, and accomplishes its purpose of showcasing the amazing sacrifice of the men and women who gave so much to help win The Great War. Their story has been largely forgotten by time. This new book of mine will correct that gaping hole in local, state and national history, and for that, I’m truly grateful. In the following weeks or months, I’ll go out into the world and give a few lectures and sell a few books. That will be very good for me. And focusing on future happy thoughts rather than depressing past events helps promote the healing of my shattered heart. It’s a good book, and it’s an important book, and hopefully, it will bring many blessings to its readers. To pre-order a copy of “Penniman, Virginia’s Own Ghost City,” click on the Paypal button below. Price is $29.95 plus $6.00 shipping. This first printing will be only 200 copies, each of which will be signed by the author. 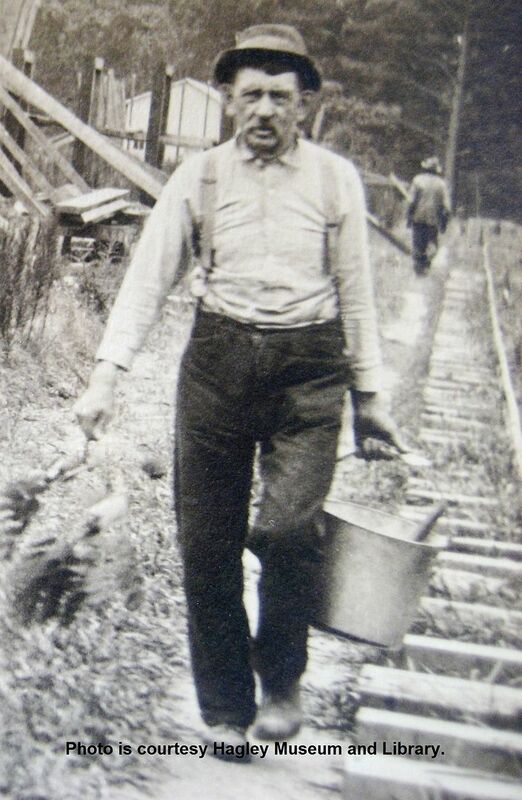 This photo was taken seven days before his death. I've often studied this photo and wondered, did I miss something? I knew those eyes better than anyone, yet I had no inkling that he had a plan. Front cover of the Penniman book. The rear cover - just as it will appear. This Penniman worker has traversed a great distance to buy the new book. On April 18, 2016, I left my home at 4:00 am to catch a 5:30 am flight for Boston, Massachusetts, where I’d visit my daughter and her son. After four years of intense research and work, the manuscript on Penniman was finally 98% complete, and now it was time for a graphic artist to assemble the artwork and prepare the book for a printer. An impressive history-loving group in Colonial Williamsburg had asked me to give my first public talk on Penniman on April 24th. As soon as he’d found out that I’d landed in Boston, he left his office at City Hall and committed suicide. Within an hour of landing in Boston, I received a phone call that my husband was dead, by his own hand. The day of my “big talk” in Willliamsburg turned out to be the day of my 63-year-old husband’s funeral. Since then, I haven’t been able to look at the Penniman manuscript. Even now, it’s hard to look at these photos, but I know - after talking with other “suicide widows” (as we’re known) - that there comes a day when you have to push past the agonizing emotional and physical and spiritual pain and try to do one small thing. And yes, there is agonizing physical pain. I suffer from unrelenting and at times, crippling chest pain. It’s my constant companion. Writing this blog and asking for help is my “one small thing” today. This morning, after talking with “Leslie,” (a fellow writer and suicide widow), I realized it was time for me to climb back into Penniman and get this book finished. And that’s where I need some help. I’m in need of a graphic artist that can help me assemble the manuscript (22 chapters and 37 photos) into a print-ready document. If you know of anyone who’s willing to help with this project, please leave a comment below. The story of Penniman is an amazing one. 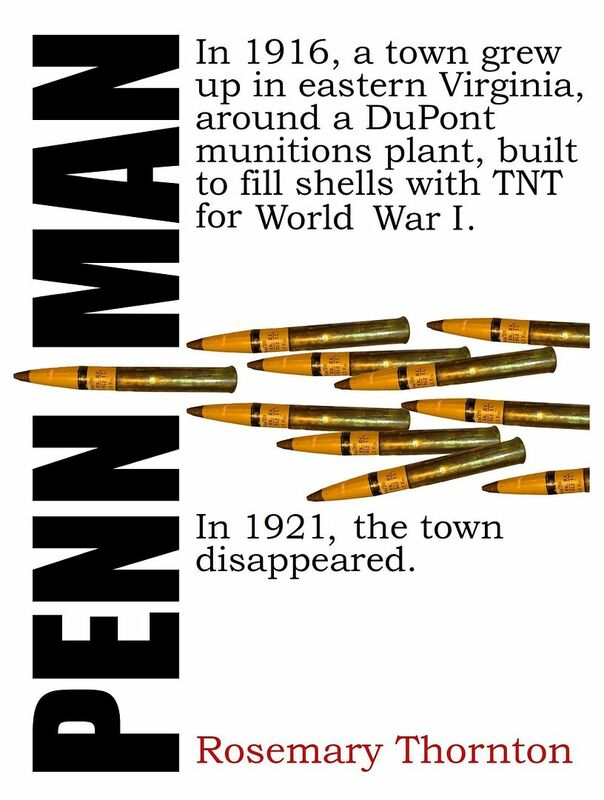 Penniman was a boom town about six miles from Williamsburg (Virginia), where TNT was loaded into shells for The Great War. 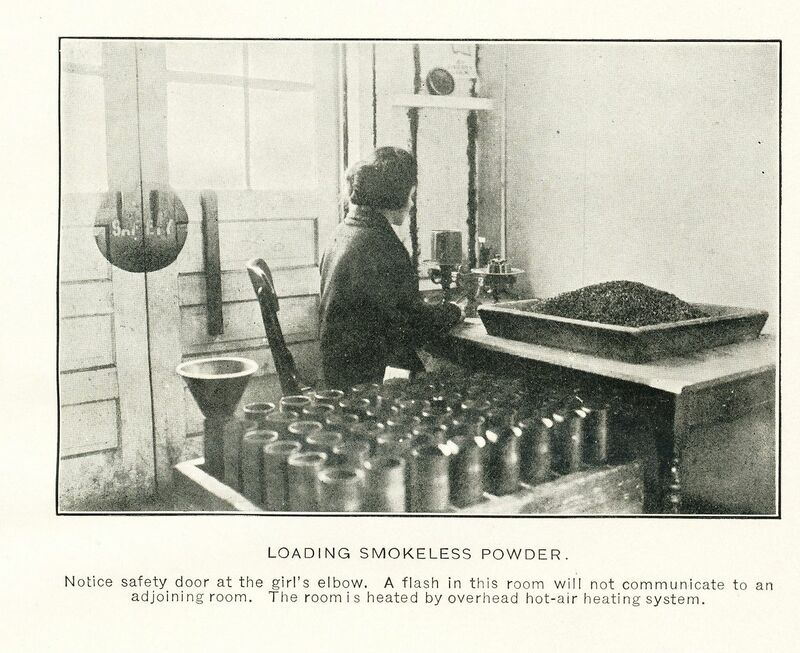 This is a picture of one of the shell-loading lines, courtesy Hagley Museum and Library. 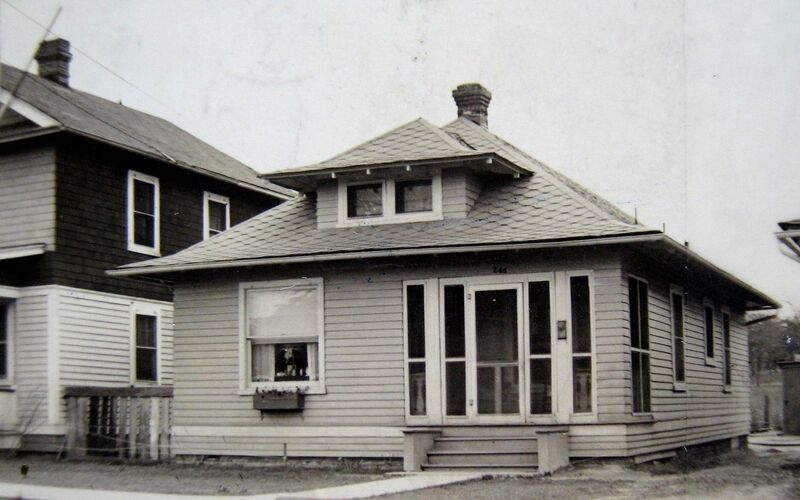 The little bungalows at Penniman were built at several DuPont sites, and were named "The DuPont." 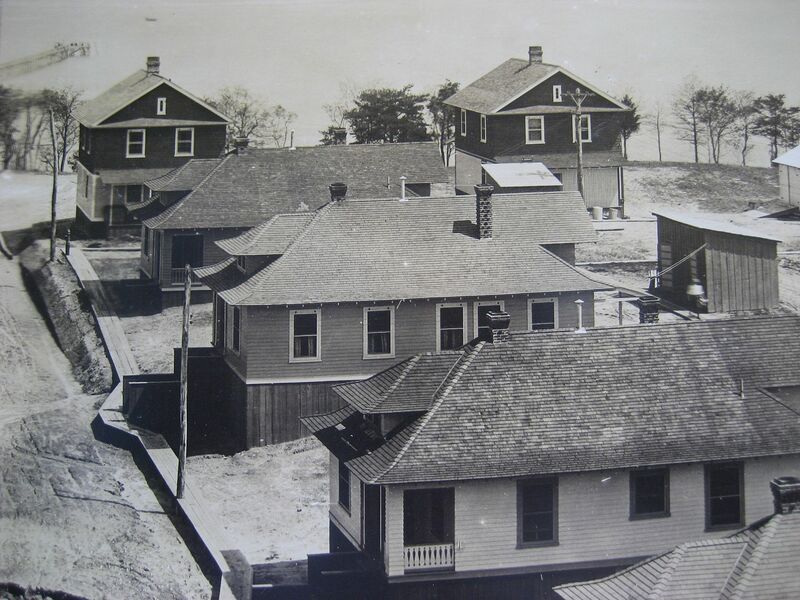 These hipped-roof bungalows sat near the York River (not far from where Cornwallis surrendered). This very model is what drew me into this story of Penniman. After Penniman closed, 18 of these houses were taken to Norfolk by barge. Photo is courtesy Hagley Museum and Library. This photo is from the Norfolk tax assessor's office. It is from 1949, and shows "The DuPont" in largely original condition. 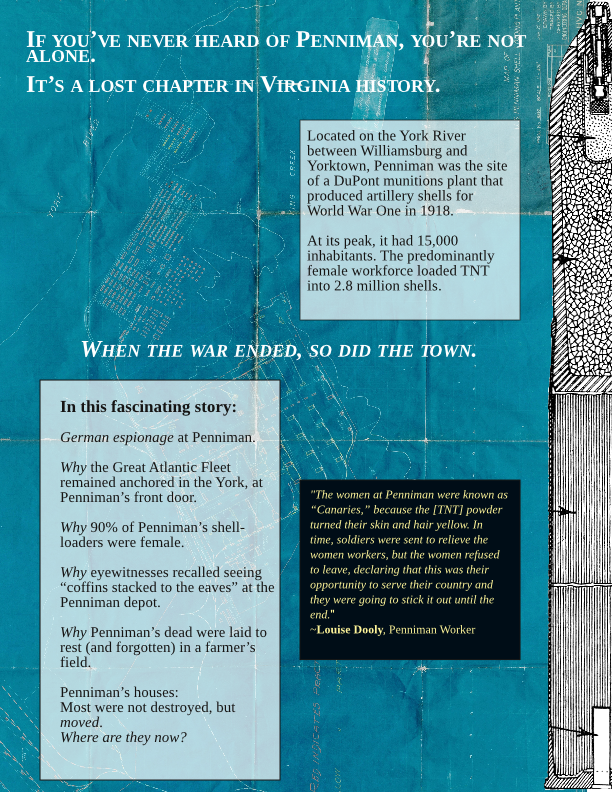 The people of Penniman are part of what make the story so compelling. 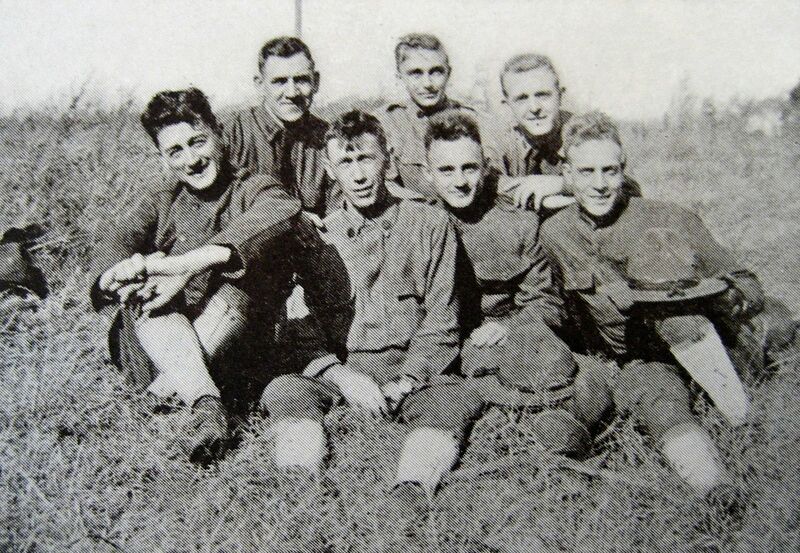 There was a 312-man army detachment at Penniman known as The Shell Inspectors. It was their job to make sure that, at every point and turn, the shells were correctly loaded and stored. It is the people of Penniman that make the story come alive. 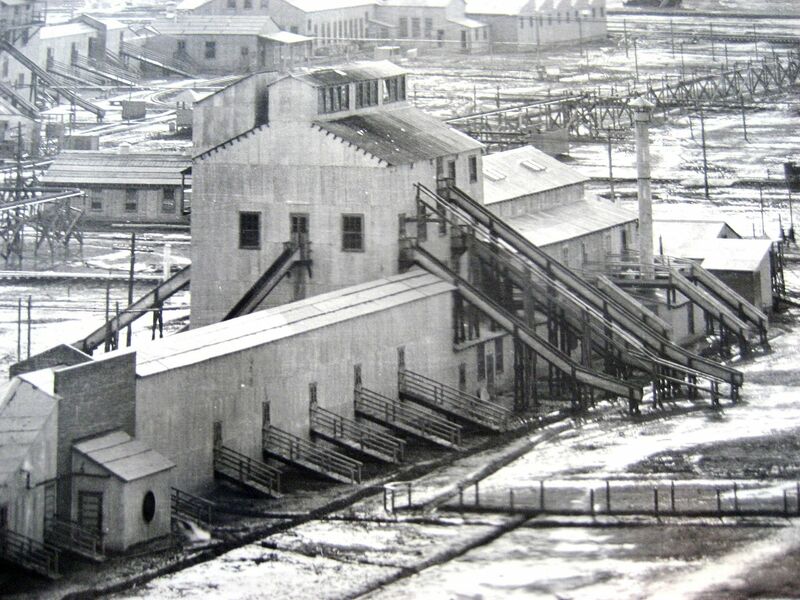 More than 50% of the civilian employees at Penniman were women. 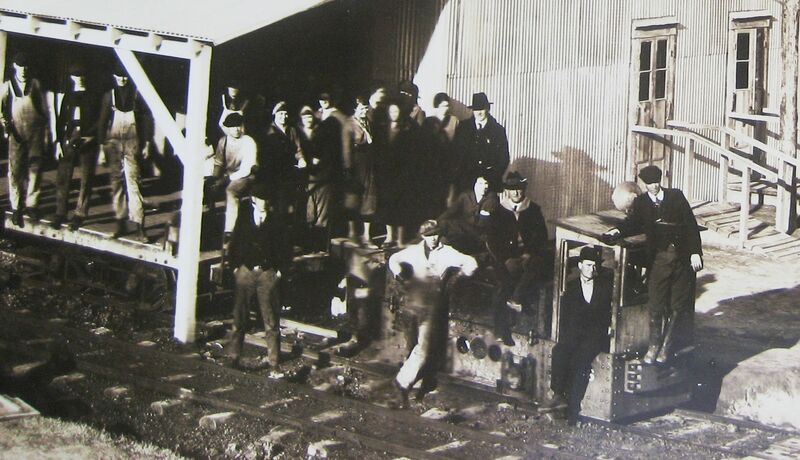 They're shown here at the train depot within Penniman, where shells were shipped out on their way to the front. Photo is courtesy Hagley Museum and Library. 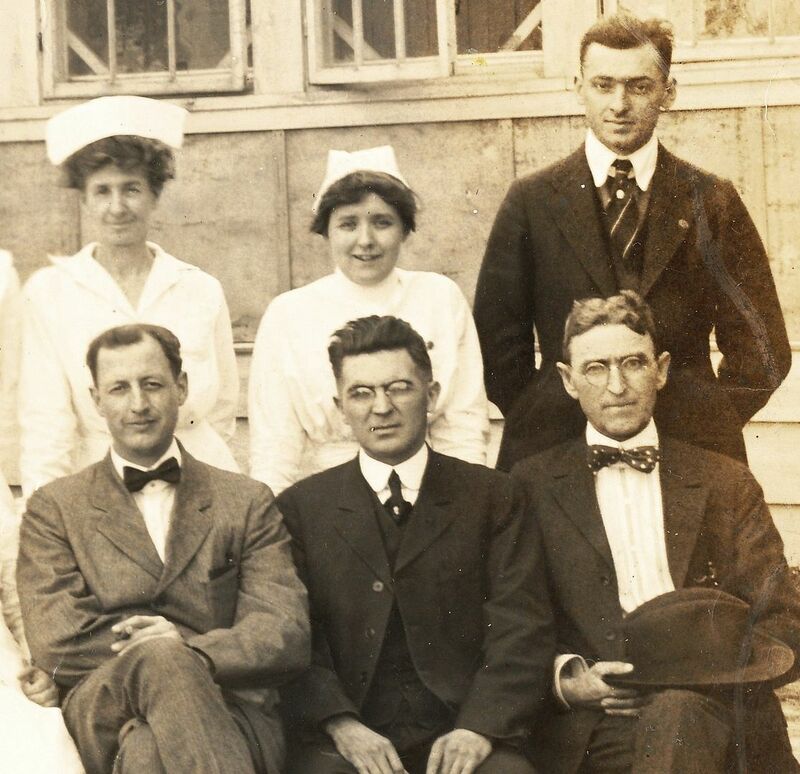 Dr. John Henderson (far right) sits with other medical personnel at the Penniman Hospital. Photo is courtesy of the Henderson Family. The names of the other workers are lost to history. 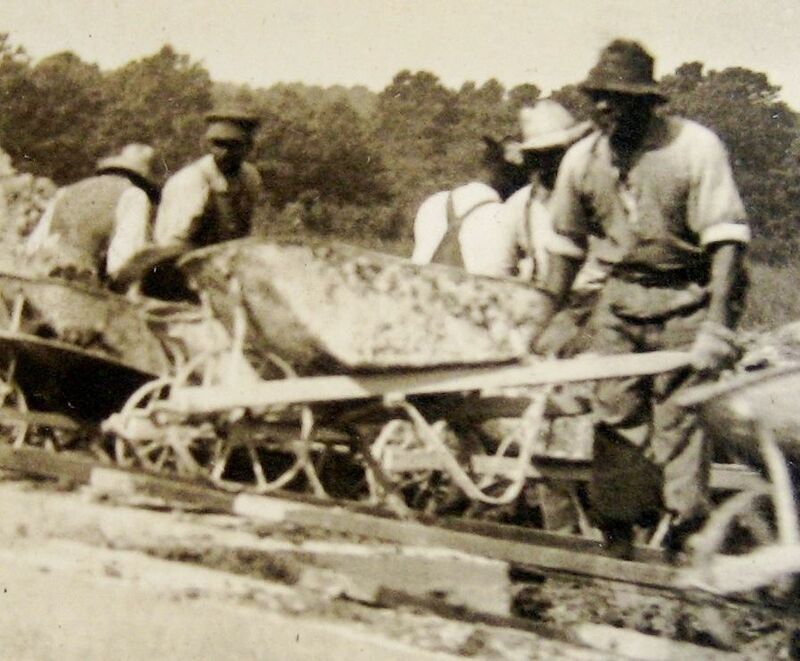 More than 900 wheelbarrows were purchased for the building of Penniman, and a large number of African-Americans were employed in its construction and day-to-day production. Photo is courtesy Hagley Museum and Library. 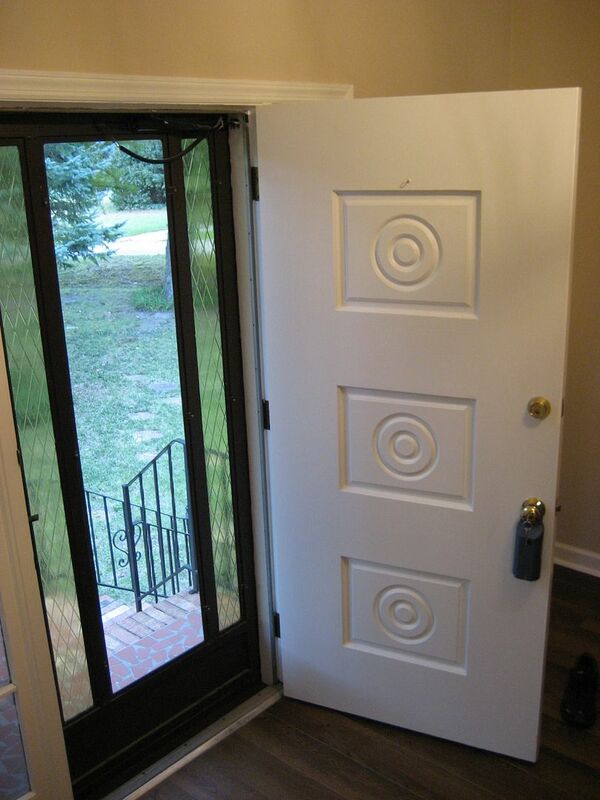 Those double doors require only a push to open, and on the other side is a long chute, leading to the ground. See those long chutes? Photo is courtesy Hagley Museum and Library.